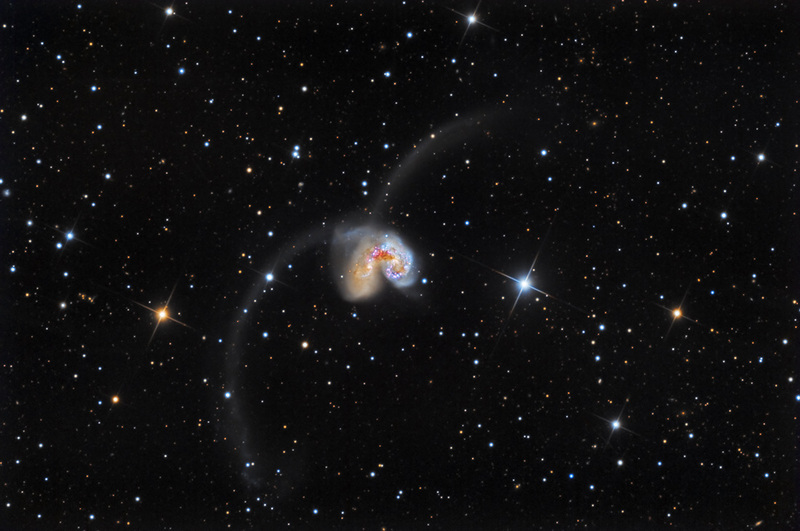 ​are a spectacular pair of galaxies under collision! Discovered by William Herschel in 1785, they are experiencing rapid starburst. Before they began to approach each other some 1,000,000,000 years ago, they likely looked similar to NGC 2207 and IC 2163. 300,000,000 years ago, both galaxies began to release the antenna-like star streams which give the duo its popular name. It is estimated that within 400,000,000 years, the two nuclei will merge, forming a single elliptical galaxy. Many thanks to my friend Kenric Kattner for acquiring the data near Fredericksburg, Texas. Follow the high-res link below for a version taken at SSRO.